Writing is a brave adventure, an odyssey of discovery that can take you far out to sea in unfamiliar waters, alone in your own little boat. Even in our tech-driven, ultra-connected world, such a voyage can be challenging and isolating. It takes courage and persistence to see a project through from beginning to end, and sometimes the fog rolls in so thickly you simply can’t see your way forward. This is the moment when dropping anchor in friendly waters, amid a nurturing community, and receiving expert guidance to help you navigate the rest of your journey is exactly what you need. The Vagabonds Creative Writing Retreat offers you this port – a chance to concentrate on your work, with like-minded writers, in the lyrical, inspiring setting of Carmel-by-the-Sea. You'll receive expert individual and group instruction and guidance for your project, outstanding cuisine, and a safe harbor to discuss and progress with your work. Join us for an unforgettable writing journey! Carmel-by-the Sea is a writer’s dream location. Breathtaking natural beauty surrounds you. Astounding ocean views, stunning white sand shores, and brilliant winter sunsets provide unparalleled scenic inspiration. Carmel's charming European-style village boasts a multitude of cozy places to steal away and write: coffee houses, wine bars, bakeries, tea shops, and an amazing array of outstanding restaurants. Winter in Carmel is a well kept secret, with beautifully clear days and a quieter vibe, ideal for writing. 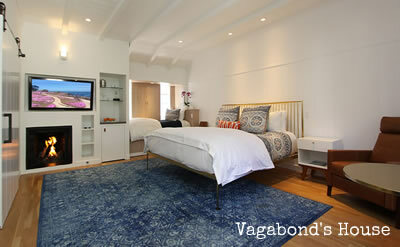 The Vagabond’s House, your host for this special writing retreat, is a world-acclaimed inn and Carmel gem. Discerning travelers will appreciate the meticulous attention to detail, that artfully mixes luxurious modern comforts with vintage charm, honoring the inn's literary and artistic origins. A magnet destination for creative seekers, The Vagabond's House lovely gathering spaces include a rock courtyard with a fireside reception area and waterfall, and a cozy, welcoming lobby, where cappuccinos are available throughout the day, and wine and savories are served each afternoon. The beautifully decorated rooms celebrate literature and the arts, and are attended to with exceptional service by an outstanding staff. Although you will feel a world apart, you are only blocks from Carmel's famous beach, in the midst of the city's finest restaurants, art galleries, book store and shops. Devoted travelers return to The Vagabond's House year after year for its immersive creative retreats and dream vacation locale. Carmel is the place to awaken all your senses, refresh and restore your spirit, and fire your creative energy, so you can forge ahead with the writing of your dreams. Long walks on the beach, soothing massages booked directly though the inn, afternoon wine tastings, or curling up with your writing project or an inspiring book, are just a few of the delights awaiting you. We'll gather Monday through Friday for workshops and writing sessions, led by author and former editor and publisher Maureen Boyd Biro, in the spacious, welcoming Carmel Woman’s Club, with special gatherings at Carmel’s beautiful beach, fireside in the courtyard of Vagabond’s House (weather permitting), and at Pilgrim’s Way Bookstore. Through conversation, writing prompts, and spirited literary adventuring, we'll tap into that creative space within and get the words flowing. Amid the comfort of world class accommodations, and the compelling, winter landscape of the sea, in the footsteps of noted California authors, you'll receive inspired guidance and skilled instruction from a writer with experience in nearly every aspect of the book industry. This memorable retreat experience, will give you ample time to focus on your particular writing project, as you engage your senses and awaken your creative spirit! Our day will begin promptly at 9:30 a.m. and conclude at 4:00 p.m., with morning and afternoon breaks, and a leisurely, on-site, catered luncheon. Readings and discussion of your works in progress will start off each day, interspersed with brief lectures and discussion of literary works, and writing exercises to illuminate effective writing techniques, including: developing memorable characters; dynamic plotting and pacing; evoking emotion; and creating a lyrical sense of place. We'll give special attention to the sometimes elusive but all important concept of "voice." Additionally, each participant may schedule a 20-30 minute individual consultation with Maureen during non-course hours to discuss your writing project, or ideas for a project, in detail, and/or to receive a written critique of your submitted work. Anyone wishing to schedule an individual consultation or receive a critique is asked to submit 5-7 pages of writing via email three weeks prior to the retreat. You are welcome to contact Maureen directly if you have questions about what to submit, or wish to submit a longer manuscript. Five days of workshops and writing sessions from 9:30 a.m. to 4:00 p.m. If you are a local resident interested in participating in the writing retreat and special events, but don't require accommodations, please contact The Vagabond's House for registration availability and information. To reserve your space, contact The Vagabond's House 831-624-7738. Enrollment in this retreat is limited to offer you the fullest experience possible. Early registration is recommended. A non-refundable deposit of $350 is due on registration with balance due prior to retreat (contact The Vagabond's House for additional information).